Preston Police are urging residents to safeguard their valuables and avoid being targeted by thieves by entering their items onto the Immobilise National Property Register. www.immobilise.com is a website which allows members of the public to register their valuables for free, using IMEI, Serial or Frame numbers. Any item can be added, from TVs to toasters, bikes to jewellery, but the most popular products which are stolen include mobile phones, laptops, games consoles and sat navs. It’s simple to use and only takes a couple of minutes to create an account and add an item, then it can be updated at leisure. For those that don’t have access to the internet, they can speak to their neighbourhood policing team, who can register items on their behalf. Police check any items they recover against the database using the dedicated NMPR service, if it’s been registered they can easily identify the owner and return the property to them, even if it hasn’t been reported stolen. The initiative is part of Preston Police’s Operation Immobilise. Any residents that already have an account can also take advantage of free window and property stickers, which are available from their neighbourhood policing team. Street signs have already been put up in the Plungington area, in particular Cambridge Close and Ripon Street. Whilst we continue to do everything possible to trace the people involved in theft and burglaries in our communities and put them before the courts, we are also asking residents to play their part by taking simple crime prevention measures. Immobilise is a powerful tool for all constabularies and helps us to identify offenders as well as reunite victims with their property. Harrogate police are urging residents to ‘lock it or lose it’ after a recent increase in the number of burglaries and car break-ins. Officers believe that the rise can be combated with the help of the community who can help reduce further offences by taking preventative security measures. Although the district has enjoyed falling figures in crimes such as robbery, sexual offences and thefts from outbuildings, burglary and theft from vehicles remains an issue which officers are keen to stamp out. Harrogate is one of the safest towns in the safest county in the country, however some people’s complacency over crime prevention is making life easy for criminals. We have to act now to ensure that offenders don’t have it their own way. Make life difficult for them, most thieves are opportunistic – if they see an unsecured door or window they will be in. What they don’t like is a challenge, it is vital that people take the proper security measures to ensure that their houses or cars are as difficult as possible to get into. Over half of burglaries occur at properties that have been left insecure and these offences could have easily been prevented by closing windows and locking doors. While investigating a recent burglary, I noticed that the offenders had climbed over several garden fences of neighbouring properties to get to the house. All the surrounding properties had burglar alarms, the house that was burgled did not. Laptops, jewellery and car keys were stolen from the house and Sgt Crocker is urging residents to consider the loss of possessions and inconvenience against the cost of having adequate security measures installed. Thefts from unattended vehicles have also gone up in Harrogate, mainly because many people are still leaving their cars unlocked. The lack of security awareness shown by some motorists is staggering, the vast majority of thefts from vehicles have come as a result of the car being left unlocked. Thieves are simply walking along the road or up driveways looking for vehicles that have been left insecure. We really need to get the message across: lock your car, remove all valuable property and leave nothing on view. Police are urging the residents of Harrogate to work with them to make life tough for criminals and help reduce the number of burglaries and thefts occurring in the town. Local Safer Neighbourhood officers are always happy to give crime prevention advice and everyone can do their bit to ensure their homes and cars are secure. We need to ensure firstly that thieves aren’t getting an easy steal and secondly that they have an increased risk of getting caught. The first part of this has to come from the community by observing basic security procedures including using locks that they already have. The second part is down to the police, to relentlessly pursue criminals, put them before the courts and continue to reduce crime in Harrogate District. Remove all valuables from your vehicle and ensure it is locked. Keep keys in a safe place, out of reach of doors and windows. Get a burglar alarm fitted preferably from a SSAIB or NSI approved company. Part set your alarm before going to bed. Photograph expensive jewellery, mark it with Smartwater and keep it in a safe. Photograph and mark expensive antiques and pictures. 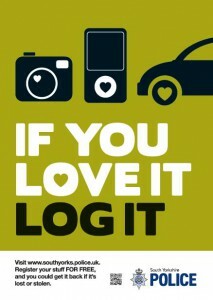 Create an immobilise account at www.immobilise.com and record your possessions on the database. Check your door lock. 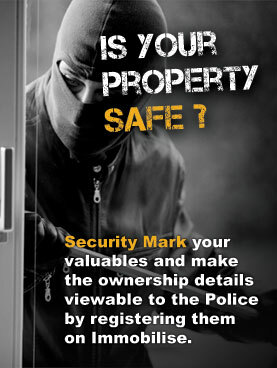 If it does not show kite mark BS3621, contact the police, a locksmith or your NHW coordinator. Greater Manchester police A6 NPT have teamed up with Currys Clearance centre, central retail park, and Immobilise.com to put together a free property marking day. All customers that purchase electrical goods from the Currys Clearance Centre or any other store on Central Retail Park, on Saturday March 20th, will be entitled to have their new item property marked and added to the Immobilise.com database and it doesn’t stop there!! If you have older items that you would like property marked just bring them along to the store with proof of purchase and we will gladly add them to the data base and mark them, The Immobilise day continues the on going force priority on domestic burglary. Bring your laptops, mobile phones, ipods and any other electrical goods to the Currys Clearance Centre, Central Retail Park, Ancoats, any time from 0900-1700 on Saturday 20th march 2010. Immobilise.com is a Home office backed, free to use website where users can create an account of their household goods for free. In the unfortunate event of any of the items being stolen they can update their account and mark the item as stolen. Immobilise.com is the first port of call for the police when trying to identify stolen goods and can increase the chances of them being returned to their rightful owner. Thames Valley Police are continuing to encourage residents to protect their property and register valuables on Immobilise.com, the UK National Property Register. The website is a free database, which is used by all police forces across the UK to help them return stolen property to rightful owners. Register your personal property at www.immobilise.com so that, if your valuables get lost or stolen and police recover it, you’ll get it back. It could also help police officers to get the burglar or robber convicted. It takes a few minutes to complete the registration, allowing you to create a free, private and secure portfolio of all your personal property. We are continuing to urge residents to register their property, it only takes a few minutes to register and if your property is stolen and recovered there is a greater chance of it being returned. Becoming a victim of crime is an incredibly upsetting experience for people, especially if personal possessions such as cameras or mobile phones are stolen with irreplaceable photos of loved ones and phone numbers of family and friends. 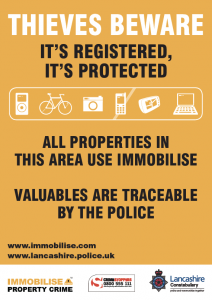 We are asking residents to help us and help themselves by registering all their valuables on the Immobilise database. People can register any item with a serial number. Police officers may then be able to return any items they find to their rightful owner. It may also enable officers to secure a successful prosecution. Thames Valley Police is currently running an initiative specifically tackling burglary, called Operation Breaker. This Forcewide campaign received a £143,000 funding boost from the Home Office on 28 December as the national ‘Operation Vigilance campaign gets underway. Operation Vigilance aims to tackle and prevent burglary and personal robbery.